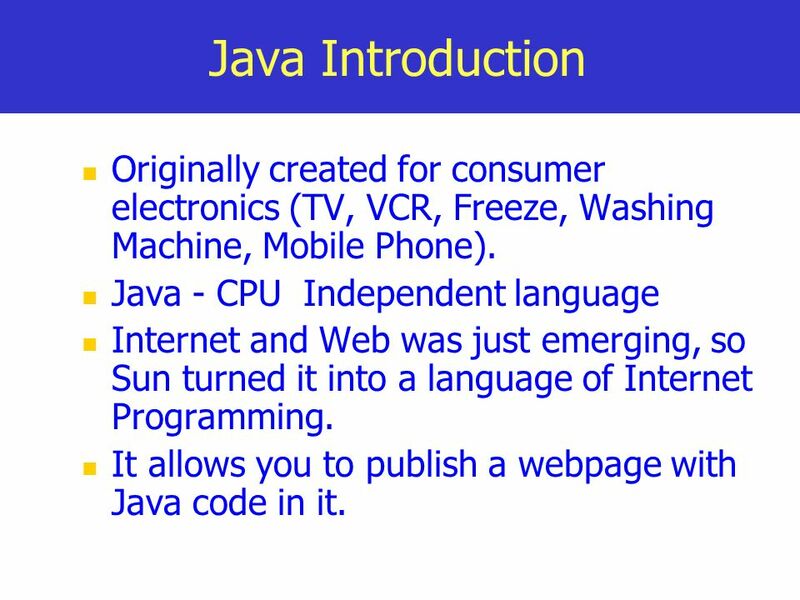 4 Java Introduction Originally created for consumer electronics (TV, VCR, Freeze, Washing Machine, Mobile Phone). 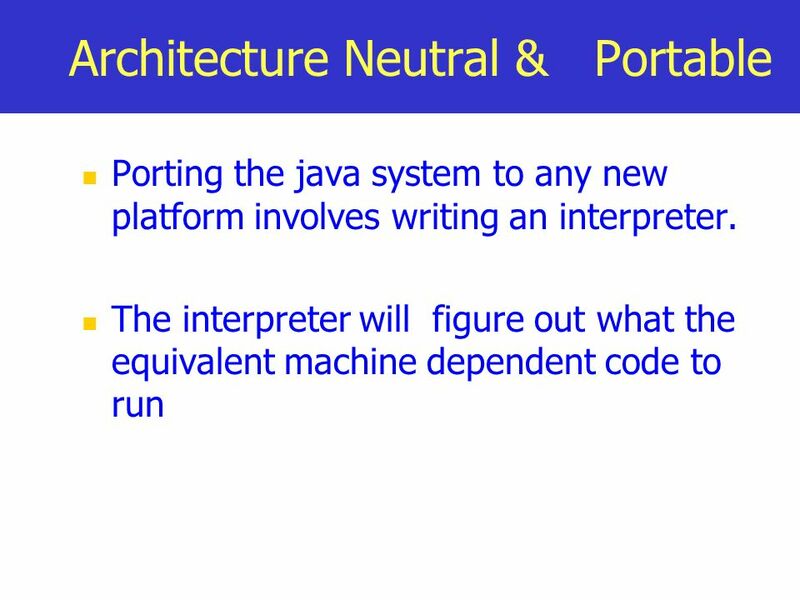 Java - CPU Independent language Internet and Web was just emerging, so Sun turned it into a language of Internet Programming. 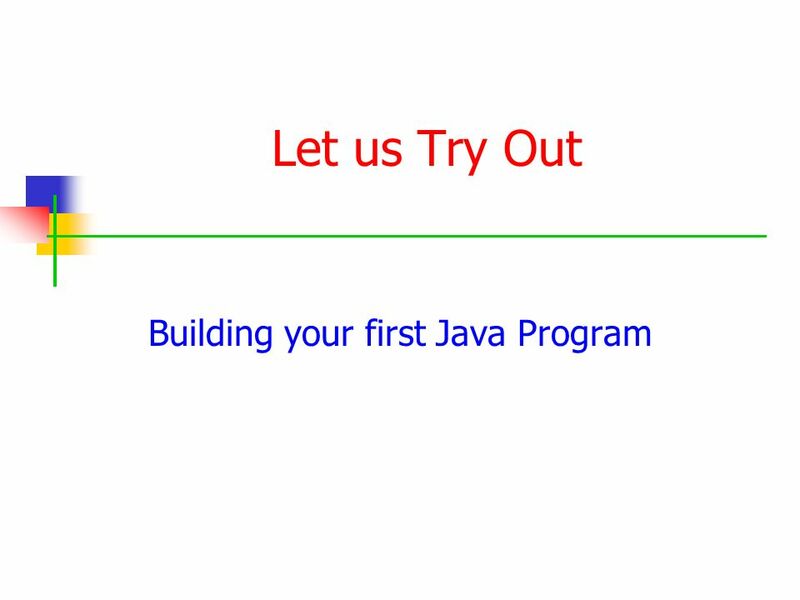 It allows you to publish a webpage with Java code in it. Sun decided to developed special software that could be used for electronic devices. 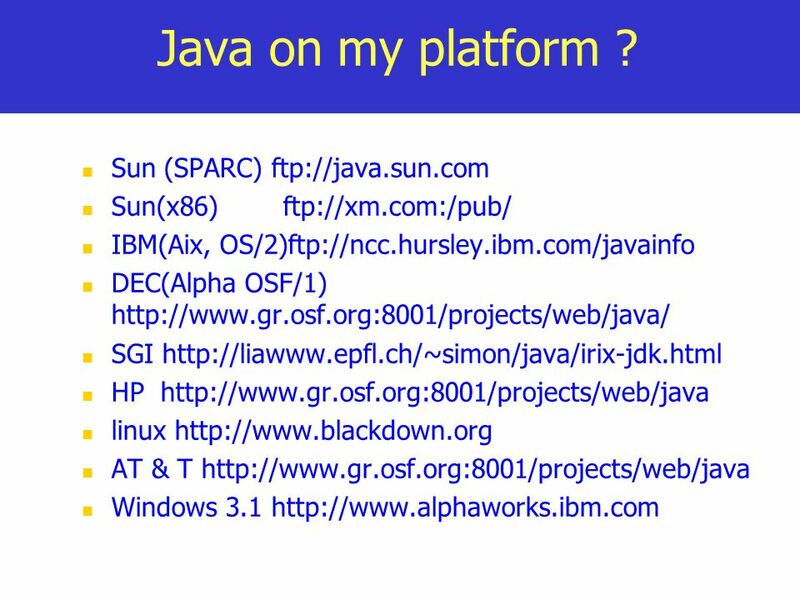 A project called Green Project created and head by James Gosling. 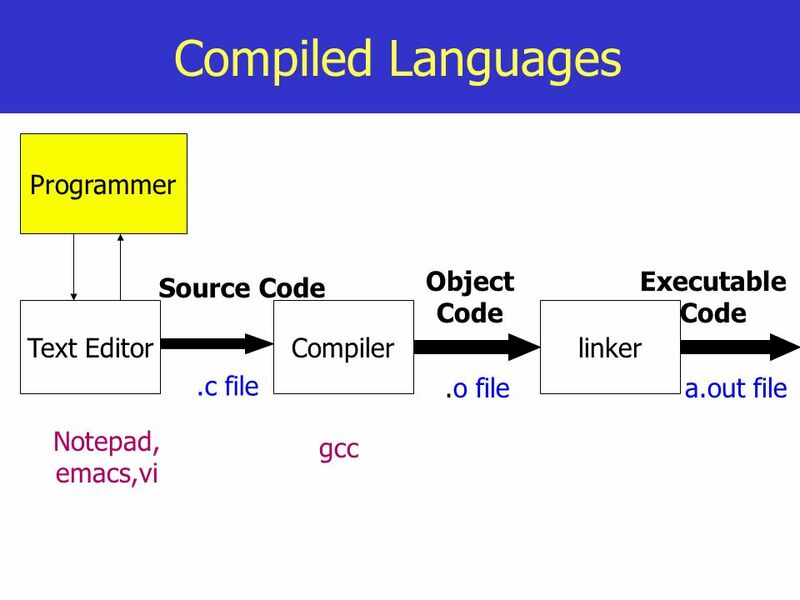 1991 Explored possibility of using C++, with some updates announced a new language named “Oak” 1992 The team demonstrated the application of their new language to control a list of home appliances using a hand held device. 1993 The World Wide Web appeared on the Internet and transformed the text-based interface to a graphical rich environment. 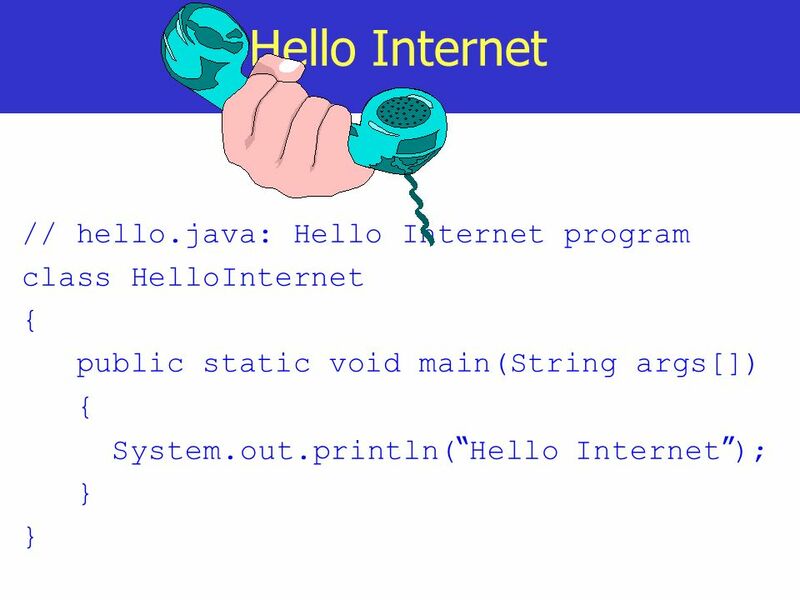 The team developed Web applets (time programs) that could run on all types of computers connected to the Internet. 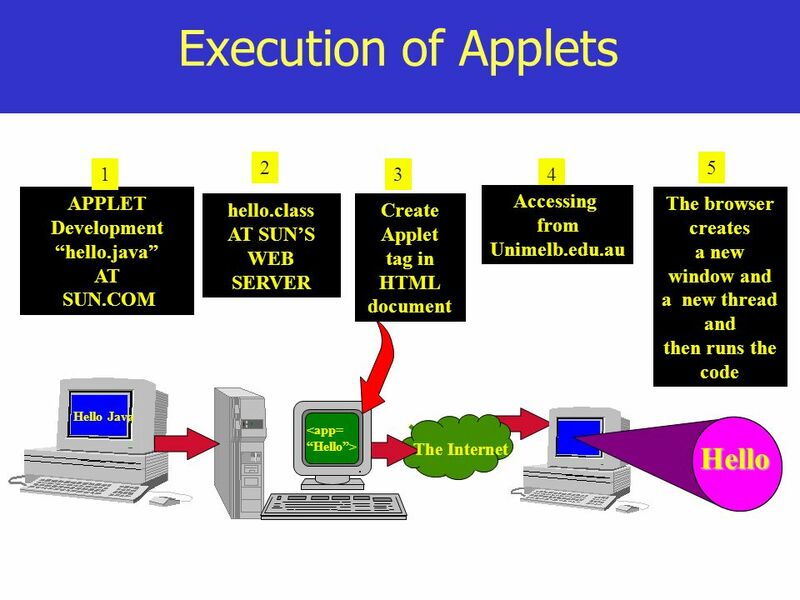 The team developed a new Web browsed called “Hot Java” to locate and run Applets. 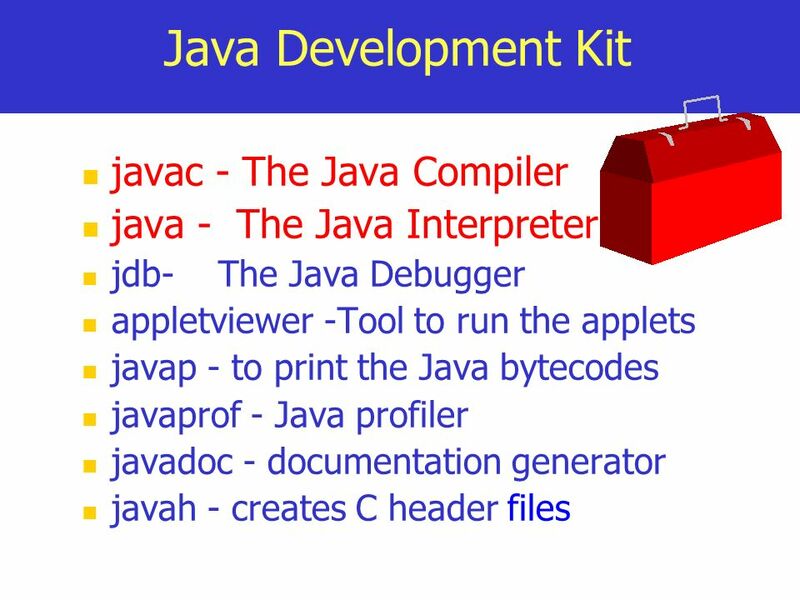 HotJava gained instance success. 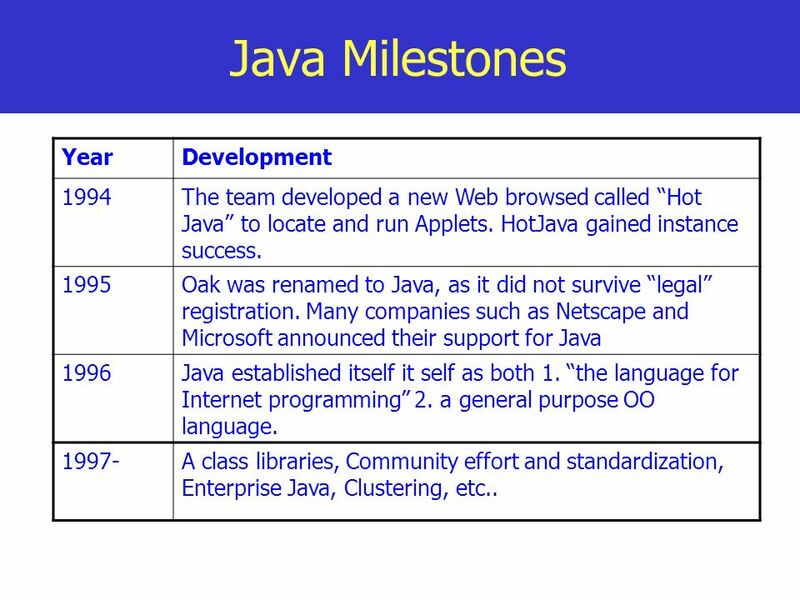 1995 Oak was renamed to Java, as it did not survive “legal” registration. 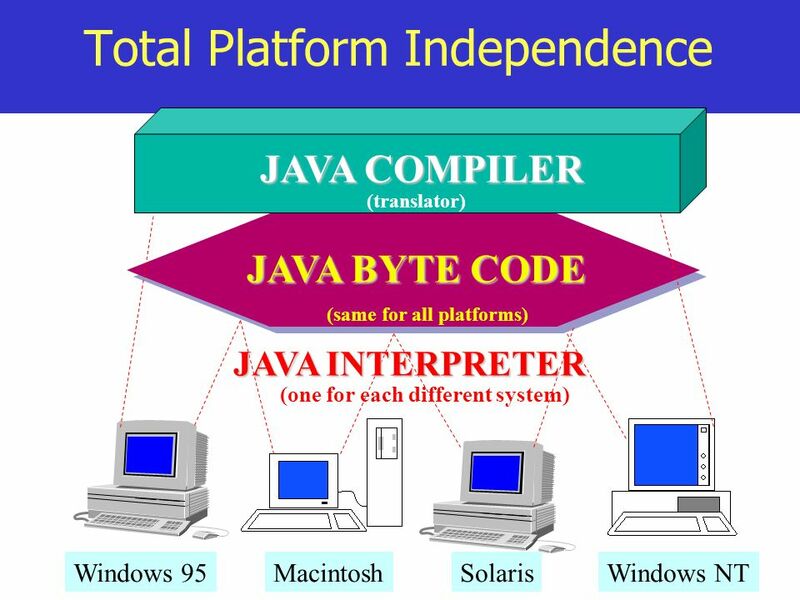 Many companies such as Netscape and Microsoft announced their support for Java 1996 Java established itself it self as both 1. 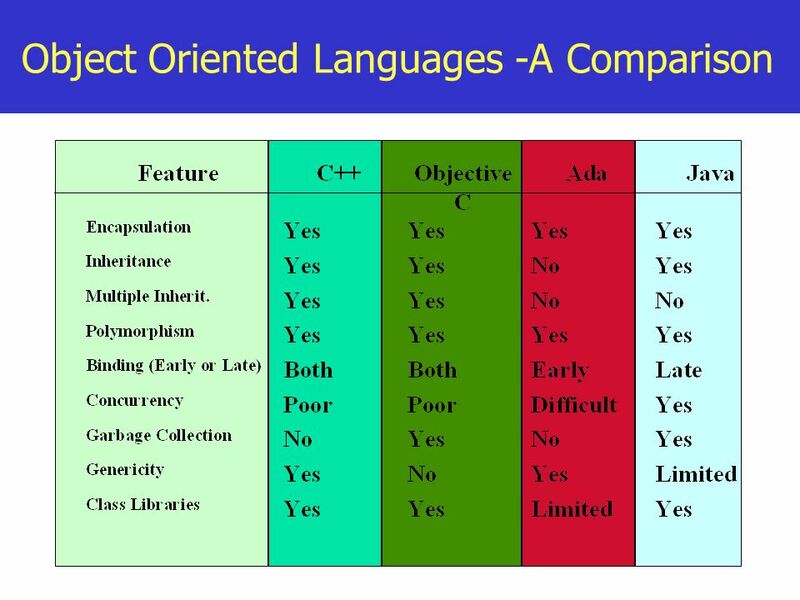 “the language for Internet programming” 2. a general purpose OO language. 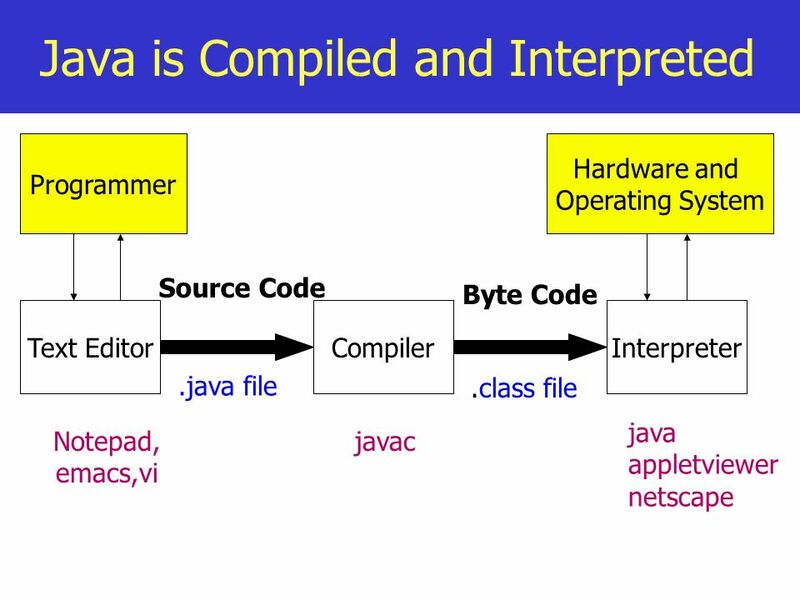 1997- A class libraries, Community effort and standardization, Enterprise Java, Clustering, etc..
Java Compiler - Java source code (file with extension .java) to bytecode (file with extension .class) Bytecode - an intermediate form, closer to machine representation A interpreter (virtual machine) on any target platform interprets the bytecode. 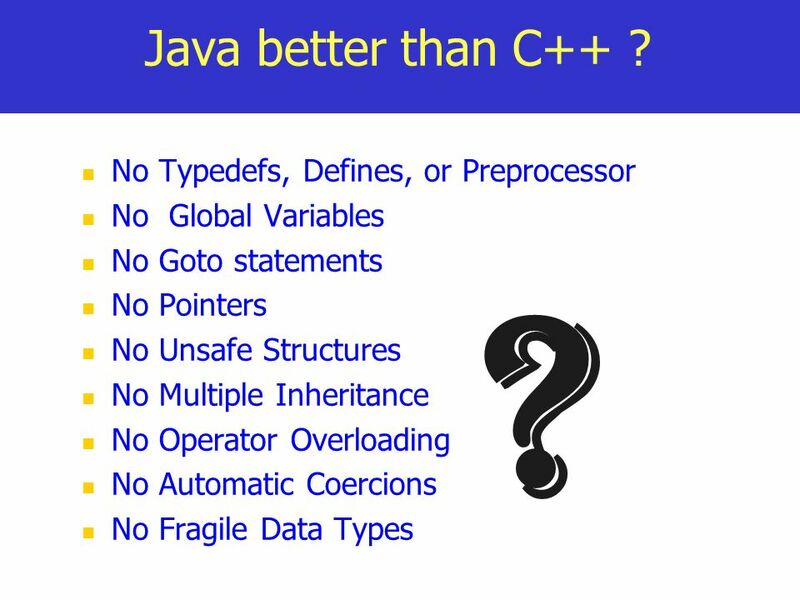 No Global Variables No Goto statements No Pointers No Unsafe Structures No Multiple Inheritance No Operator Overloading No Automatic Coercions No Fragile Data Types ? 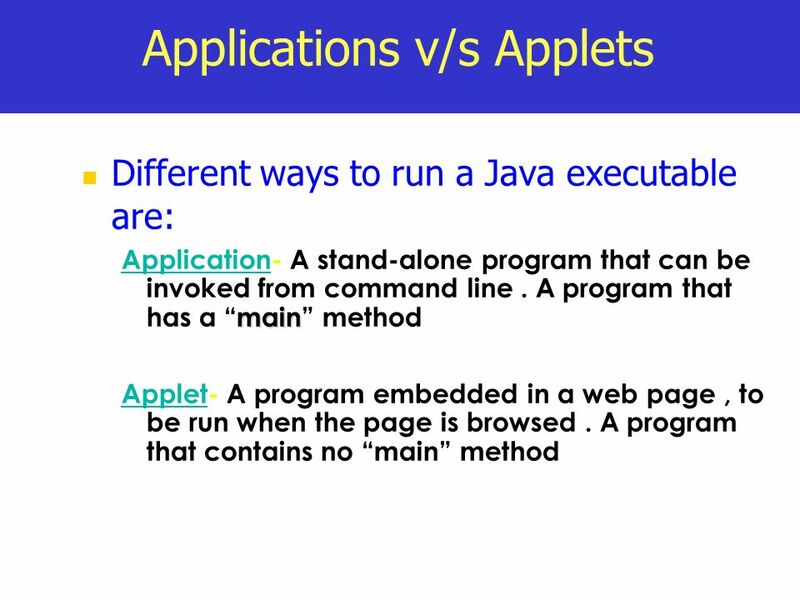 Different ways to run a Java executable are Application- A stand-alone program that can be invoked from command line . 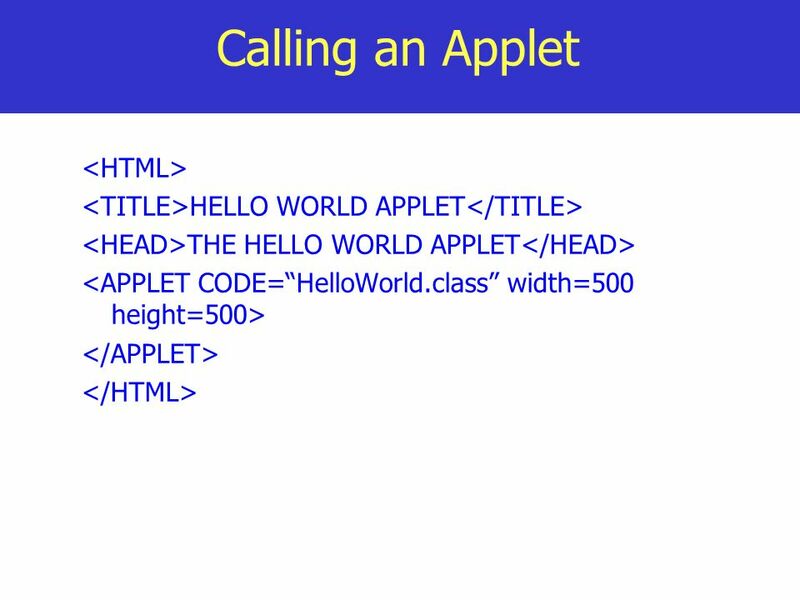 A program that has a “main” method Applet- A program embedded in a web page , to be run when the page is browsed . 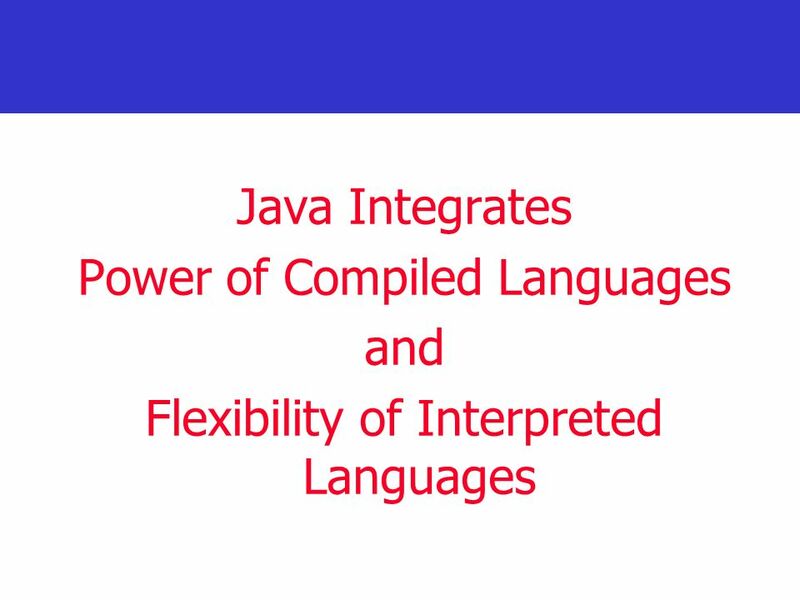 A program that contains no “main” method Application –Executed by the Java interpreter. 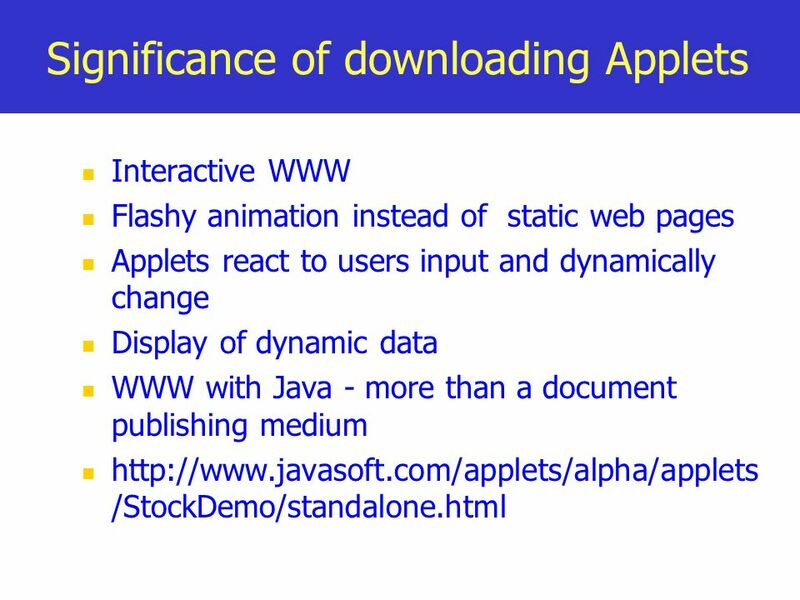 Applet- Java enabled web browser. 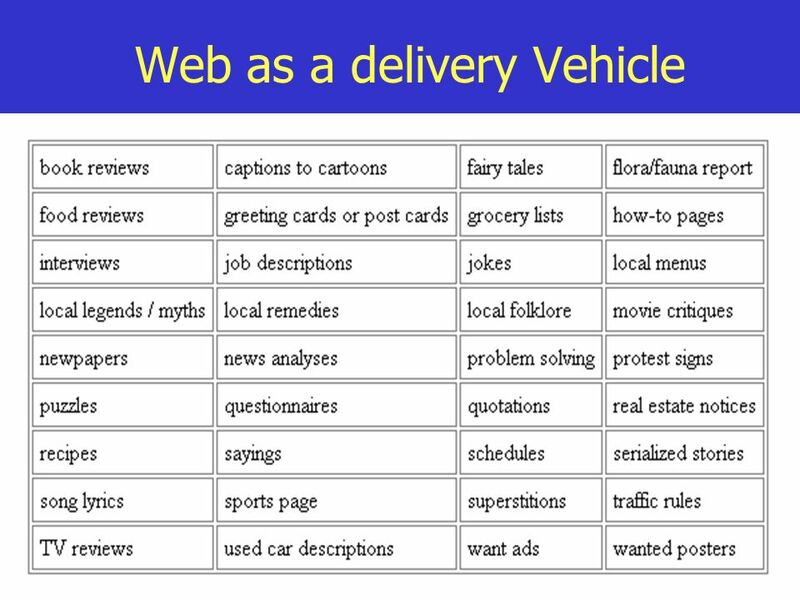 24 What is World Wide Web ? 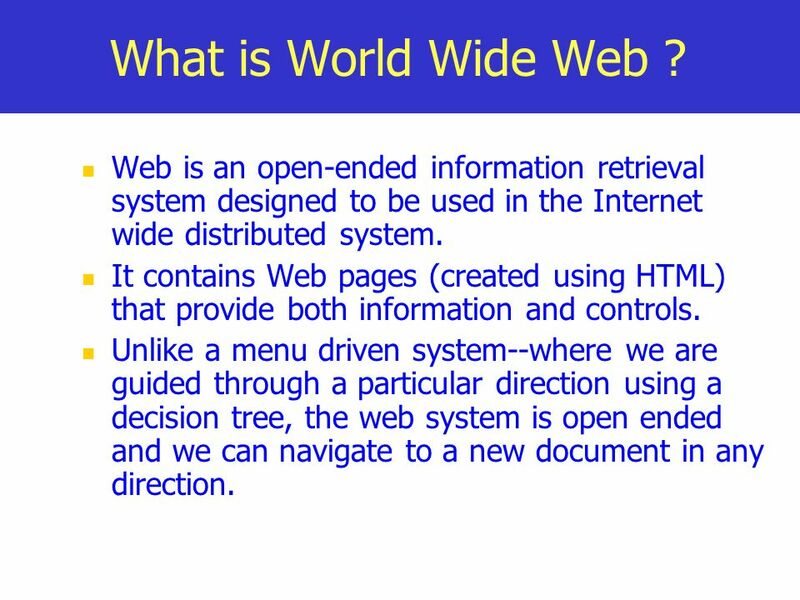 Web is an open-ended information retrieval system designed to be used in the Internet wide distributed system. It contains Web pages (created using HTML) that provide both information and controls. 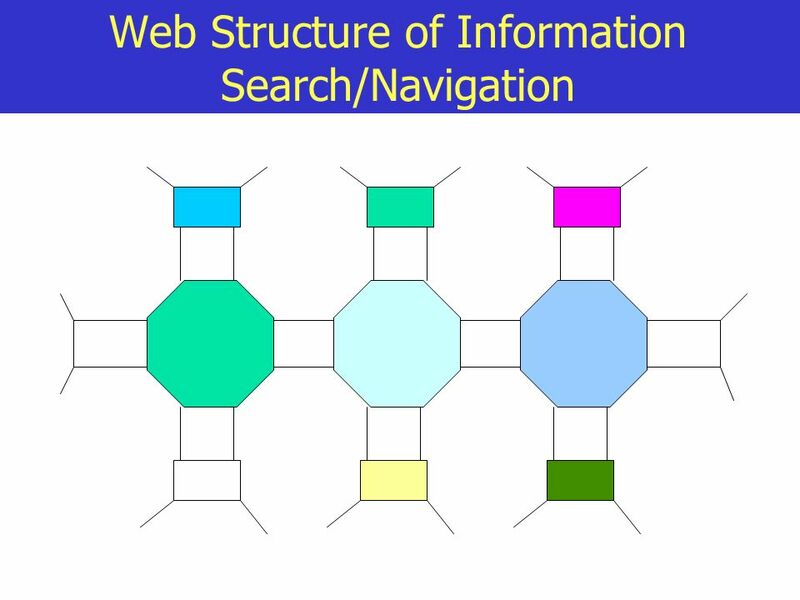 Unlike a menu driven system--where we are guided through a particular direction using a decision tree, the web system is open ended and we can navigate to a new document in any direction. 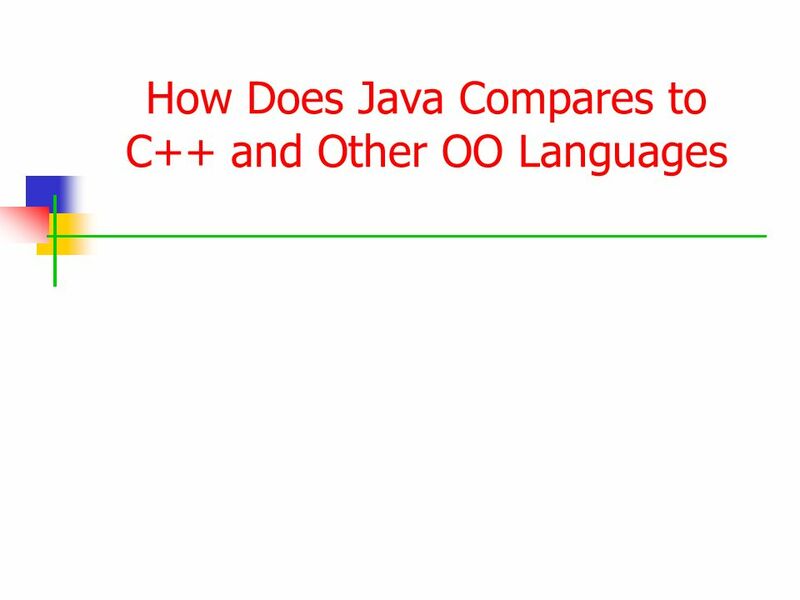 41 Summary Java has emerged as a general purpose OO language. It supports both stand alone and Internet Applications. 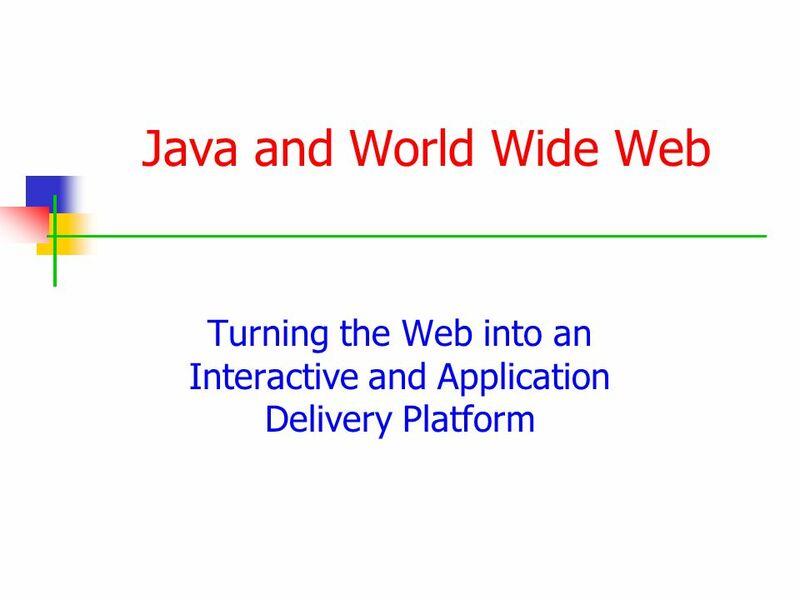 Makes the Web Interactive and medium for application delivery. Provides an excellent set of Tools for Application Development. 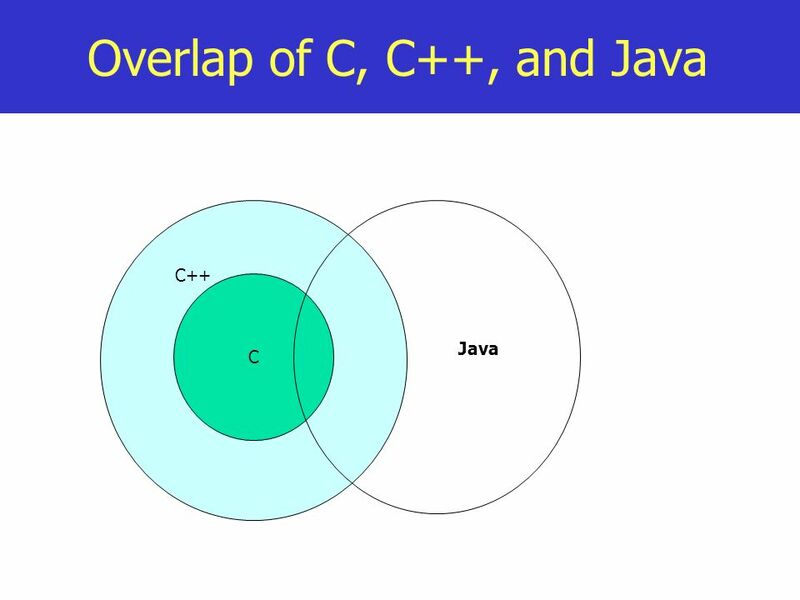 Java is ubiquitous! 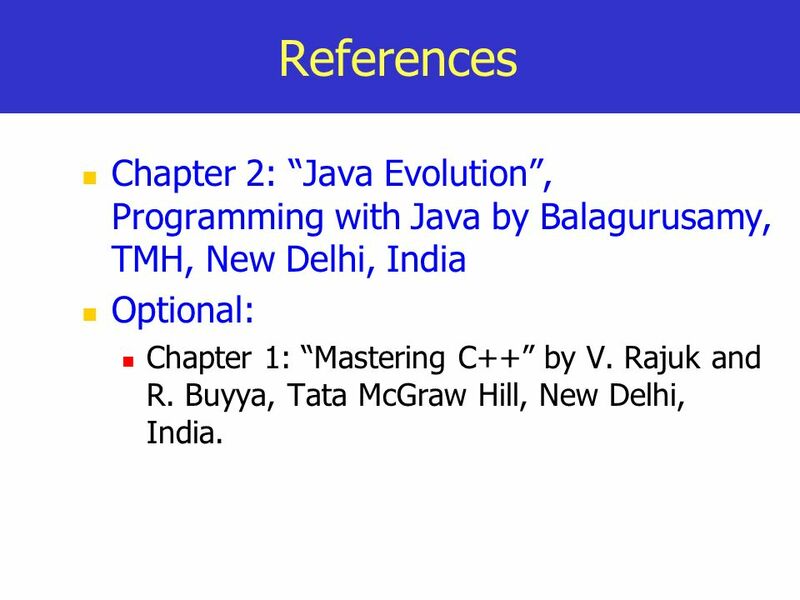 42 References Chapter 2: “Java Evolution”, Programming with Java by Balagurusamy, TMH, New Delhi, India Optional: Chapter 1: “Mastering C++” by V. Rajuk and R. Buyya, Tata McGraw Hill, New Delhi, India. 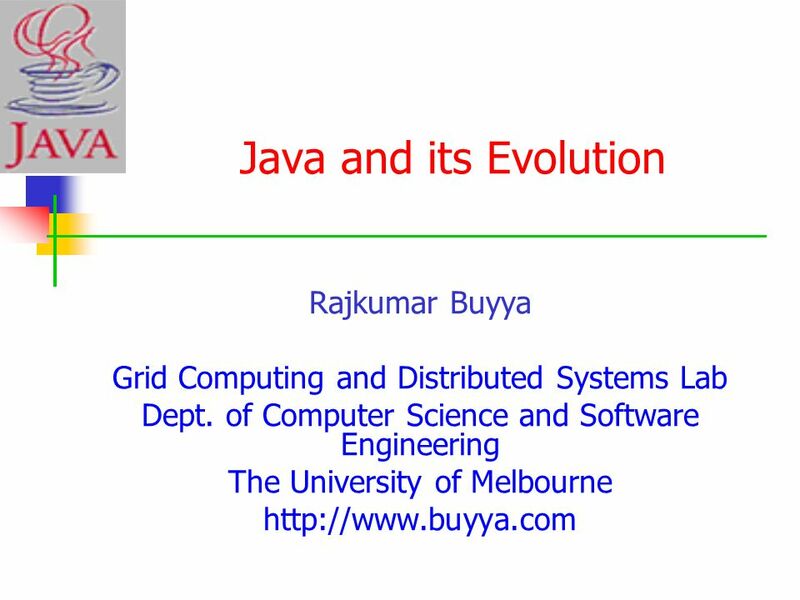 Download ppt "Java and its Evolution Rajkumar Buyya"
1 Copyright © 2005, Oracle. All rights reserved. 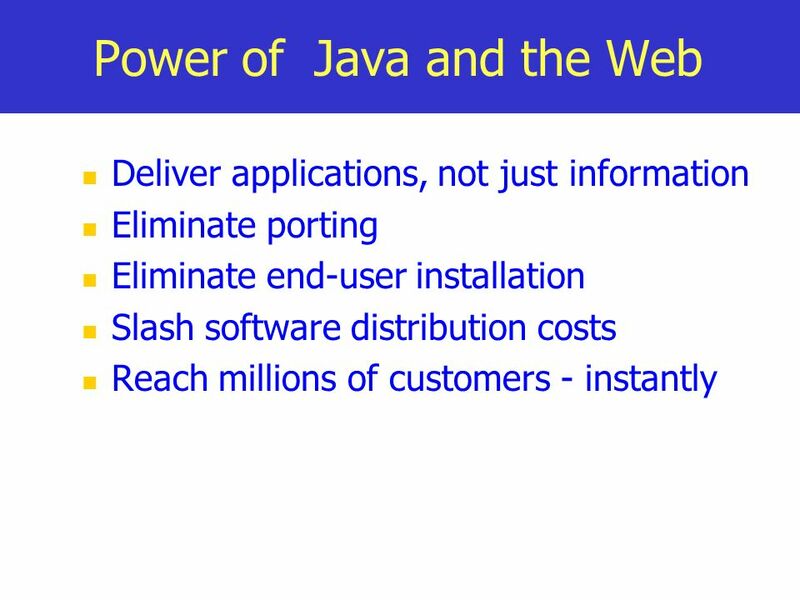 Introducing the Java and Oracle Platforms. 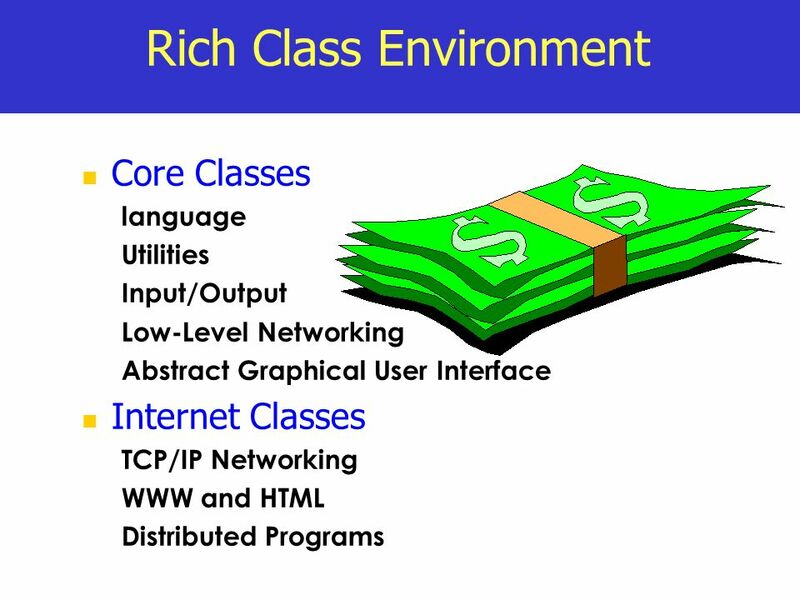 1 G54PRG Programming Lecture 1 Amadeo Ascó Adam Moore G54PRG Programming Lecture 1 Amadeo Ascó 3 Java Programming Language. 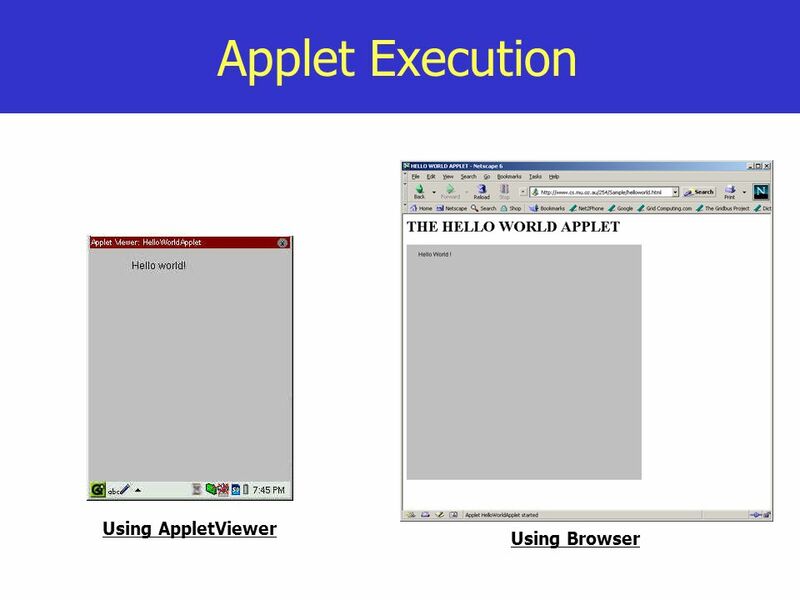 In Review JAVA C++ GUIs - Windows Webopedia.com. 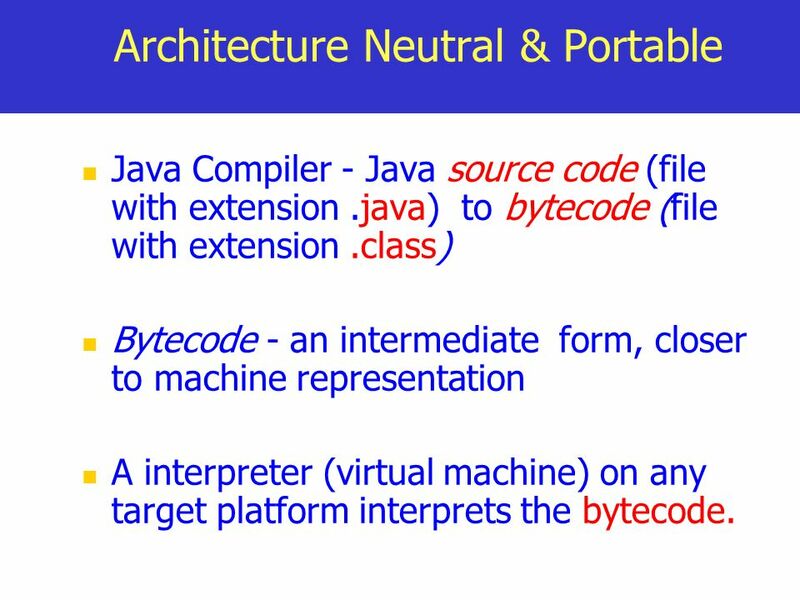 Introduction To Java Objectives For Today â Introduction To Java â The Java Platform & The (JVM) Java Virtual Machine â Core Java (API) Application Programming. 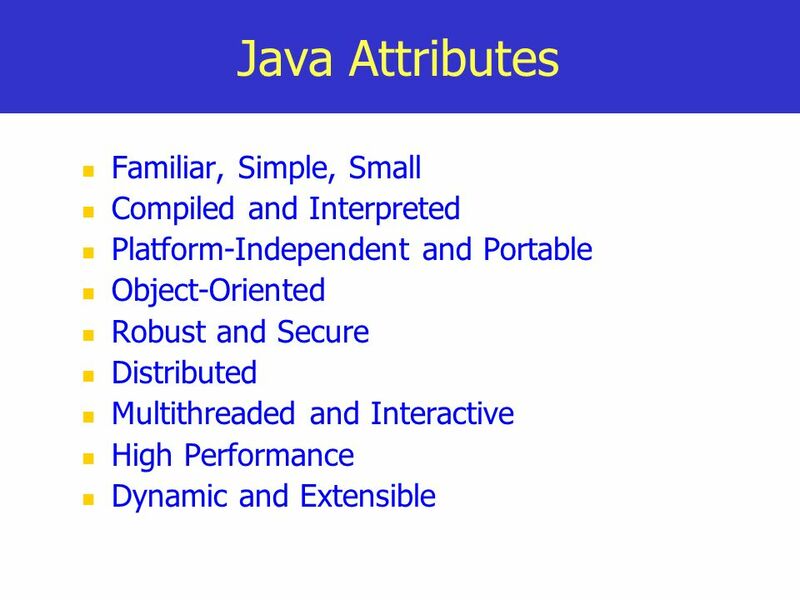 Introduction to Java The objectives of this chapter are: To describe the key aspects of Java To describe the Java software development kit (SDK) To explain. got ? Research Project – April 1998 Hang Xia, Mark Wang, Richard S. Chang Updated: R Norman, August 1999. 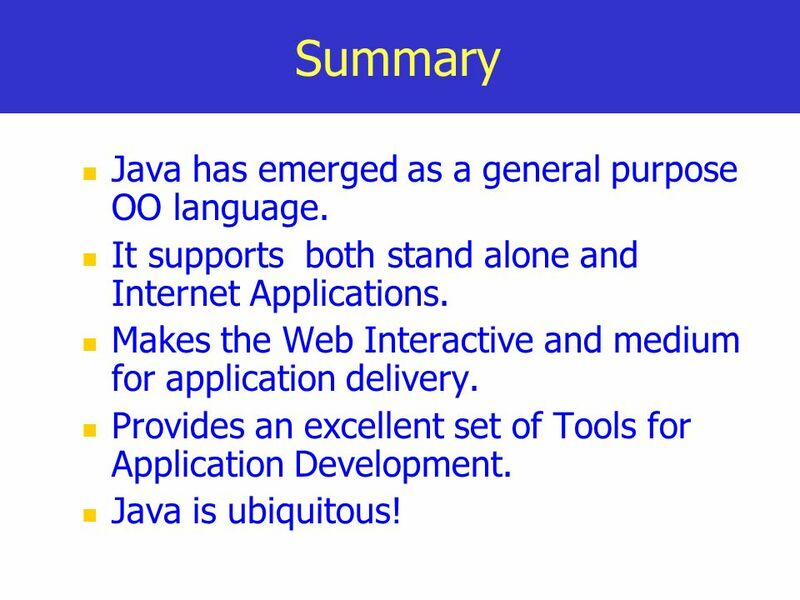 Java: History and Introduction (Lecture # 1). 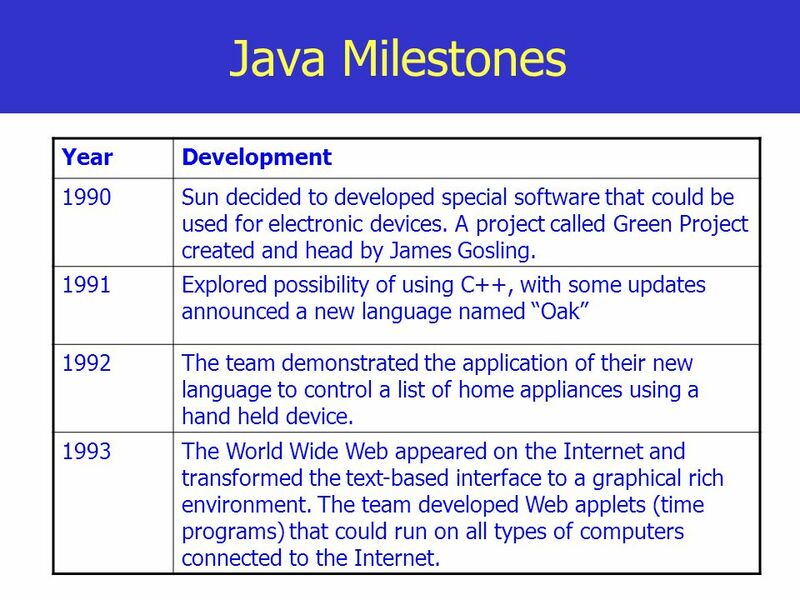 History… Java – Based on C and C++ – Developed in 1991 for intelligent consumer electronic devices – Green. 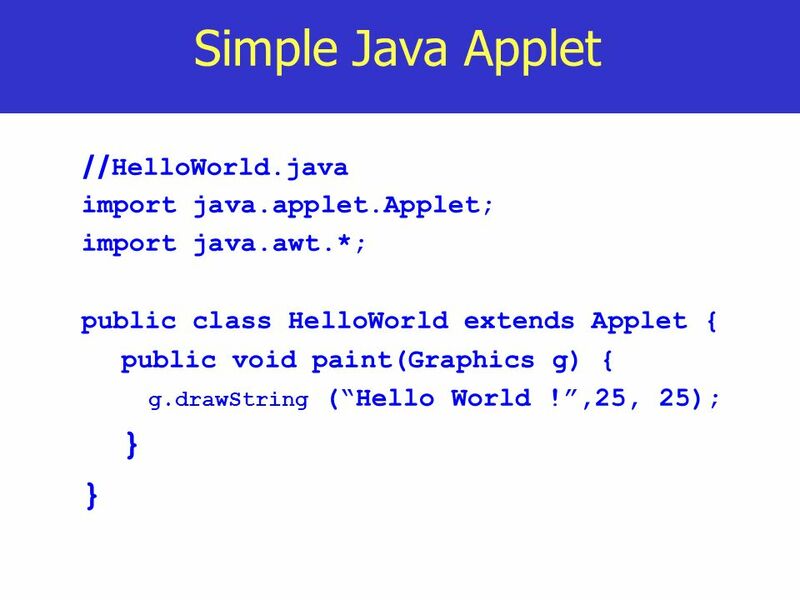 Introduction to Java Kiyeol Ryu Java Programming Language. 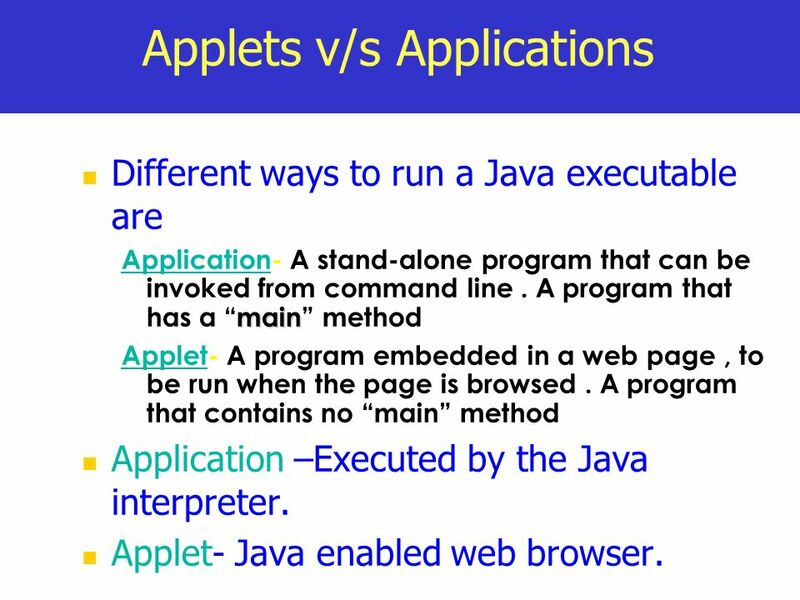 1 Introduction to Java and Applet Lecture 3 from Chapters 1 and 2 of the complete reference. L EC. 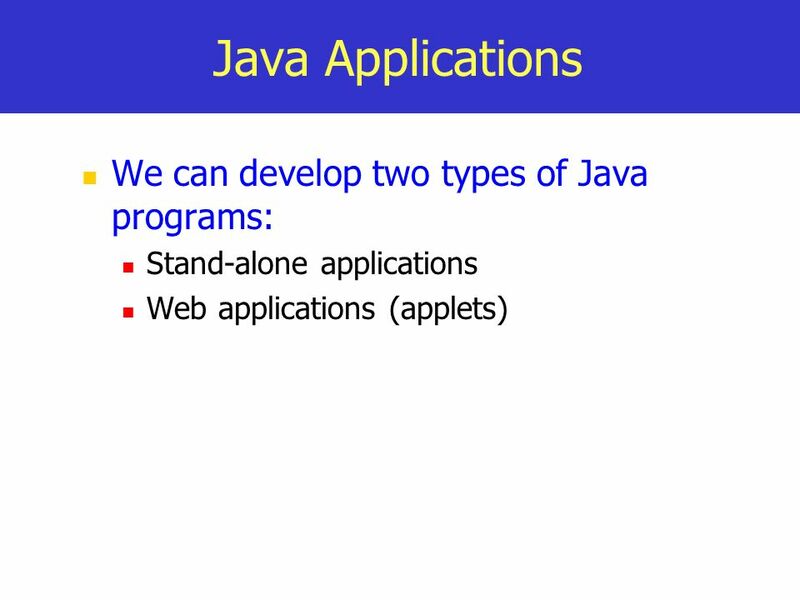 01: J AVA FUNDAMENTALS Fall Java Programming. 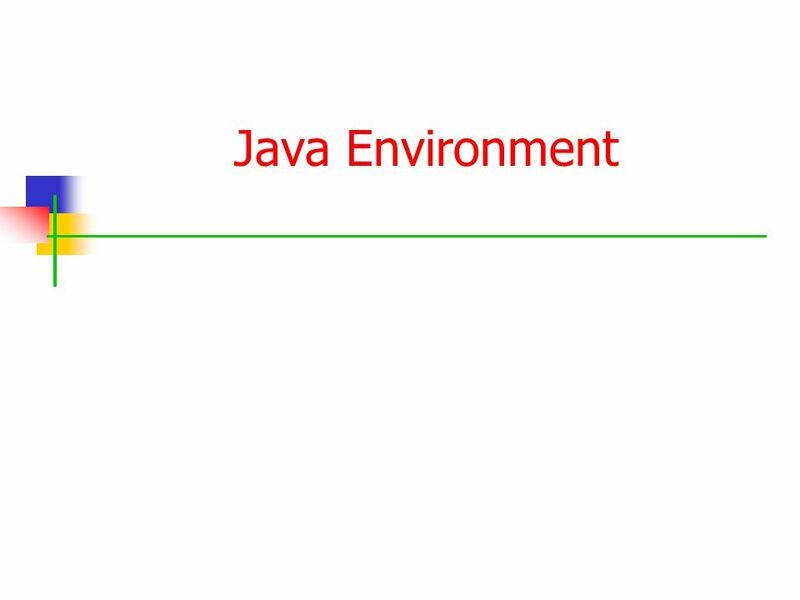 01 Introduction to Java Technology. 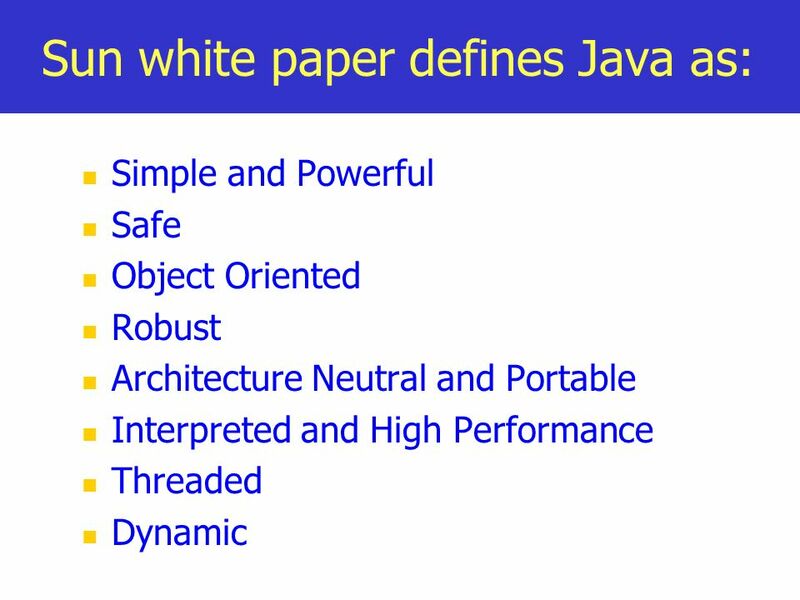 2 Contents History of Java What is Java? Java Platforms Java Virtual Machine (JVM) Java Development Kit (JDK) Benefits. 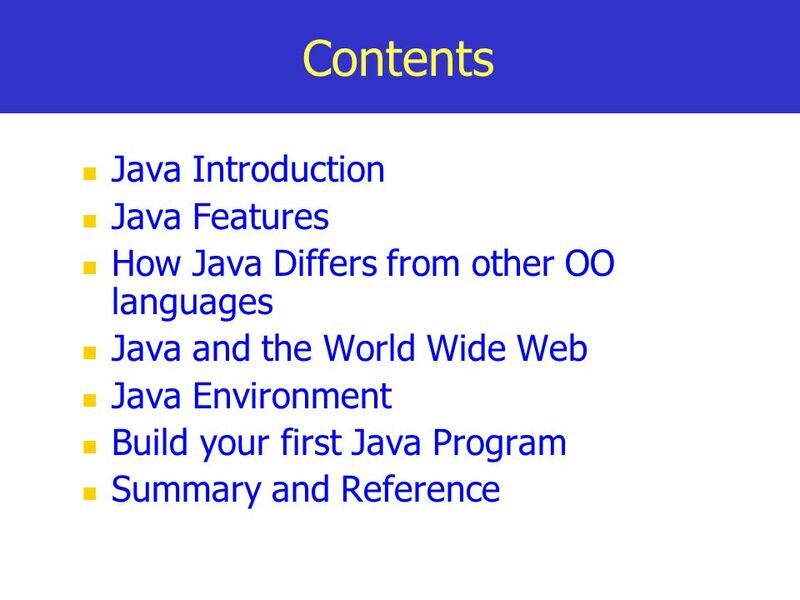 LESSON 1 INTRODUCTION Compiled By: Edwin O. Okech [Tutor, Amoud University] JAVA PROGRAMMING. Sadegh Aliakbary Sharif University of Technology Fall 2011. 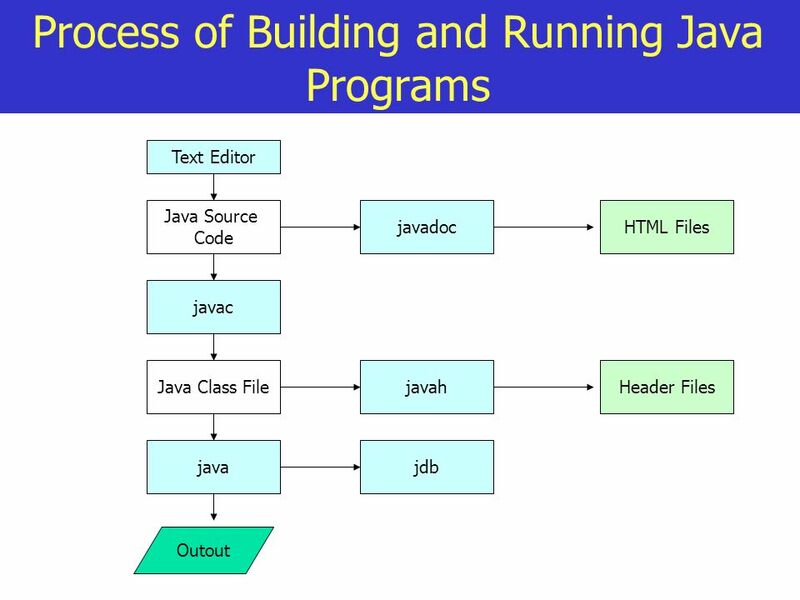 BASIC JAVA PROGRAMMING TUTORIAL. 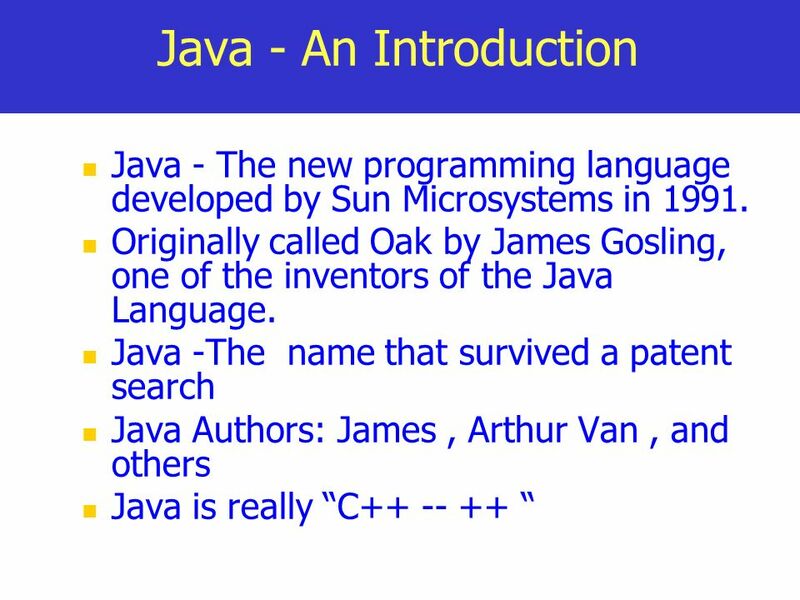 History  James Gosling and Sun Microsystems  Oak  Java, May 20, 1995, Sun World  Hot Java –The first Java-enabled. 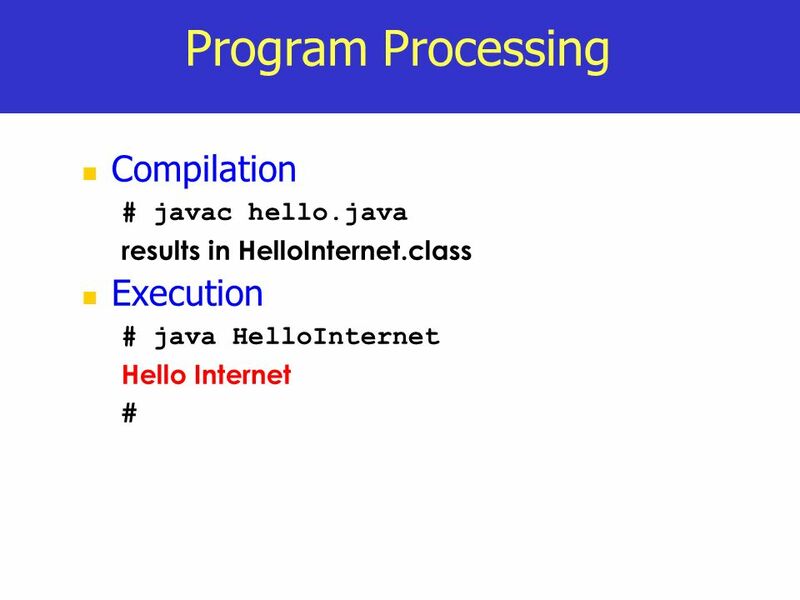 Introduction to Java Programming CS 21a: Introduction to Computing I Department of Information Systems and Computer Science Ateneo de Manila University.